Once more I’m coming at you with something totally weird but ultimately amazing. Remember when I had you put grape jelly in your meatballs? Or when I had you load up your beanie weenies with kale? Or make your chicken enchiladas with yogurt? Good times. 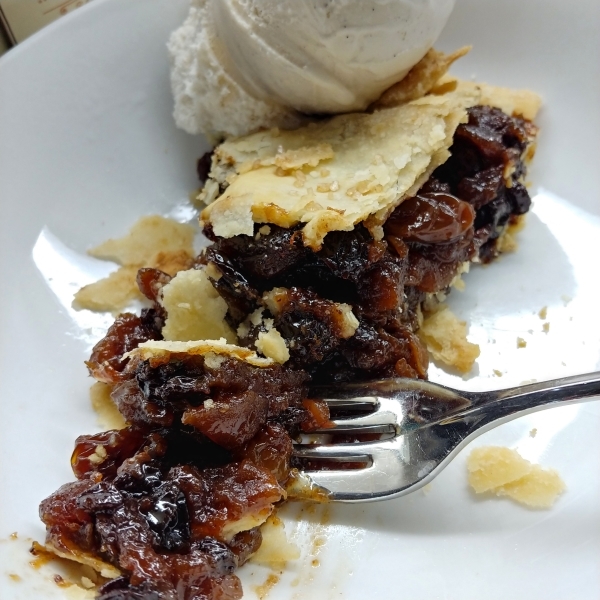 Well I’m glad I’ve got a proven track record of taking the weird and making it wonderful, because MINCEMEAT PIE does not sound like a dessert that strikes joy into the hearts of young children. But it SHOULD! It is SO DELICIOUS, my skeptical friends. 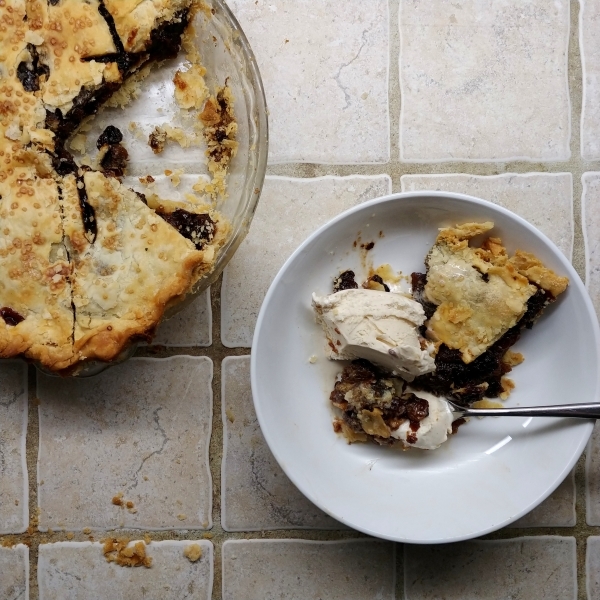 It’s like if apple cider and rum raisins had a flaky pie baby. 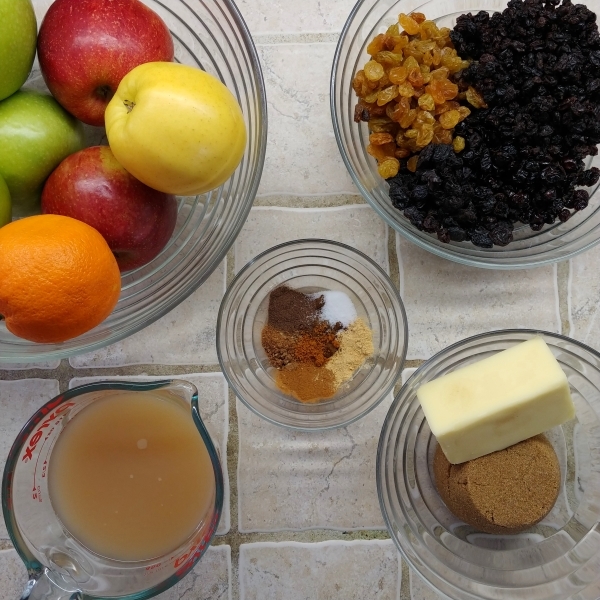 It tastes like everything you’d ever want on a cold autumn day (or a snowy winter night)— apples, cinnamon, nutmeg, ginger, allspice—it’s something deep and warming. And this version, a riff on one I found in Cook’s Illustrated a while back, doesn’t have any meat in it at all. It’s actually vegetarian—or “modern,” as they so (ahem) “modernly” put it. Plus it is SUPER easy to prep. 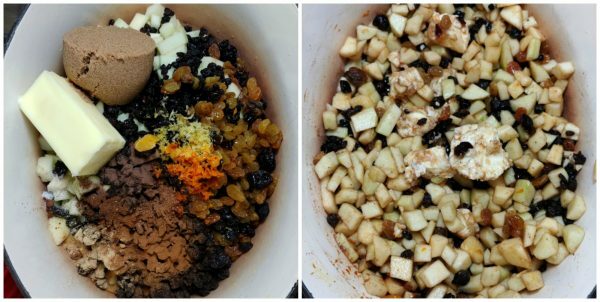 You pretty much dump everything in a pot, then stir from time to time, so it’s a great thing to make when you’re busy doing other things around the house. And as a bonus, it makes your house smell like ALL OF THE HOLIDAYS. 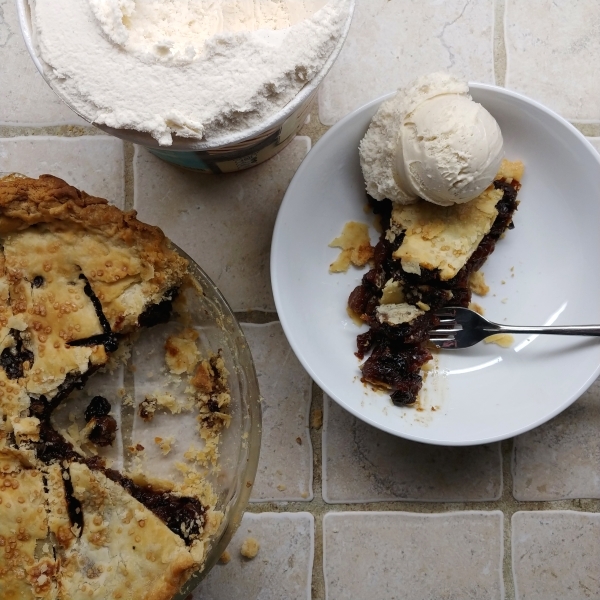 I do recommend that you make the filling a day (or up to a week) ahead of time, then fill and bake the pie the day of your pie-eating-extravaganza (or the night before). It gives the flavors a chance to meld, and it keeps you from feeling like it’s too much work to handle. 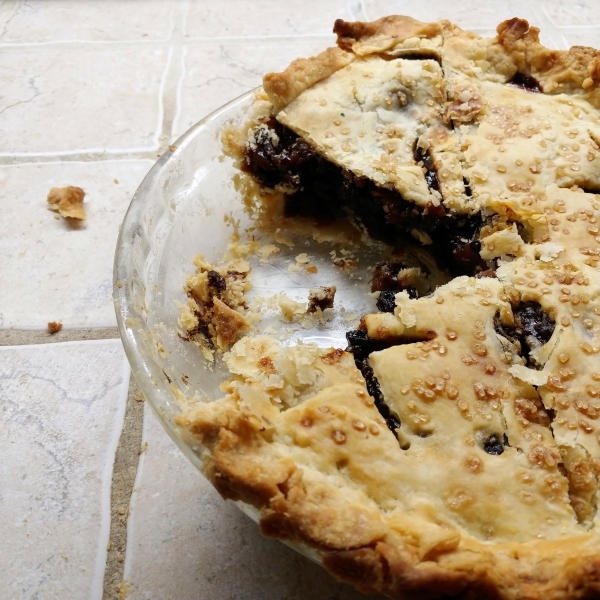 You can freeze the filling, too, and thaw it before filling and baking your pies. It also does VERY well as handpies. Just take a look at this seasonally appropriate ingredient list. Measuring everything out is half the battle here. Just measure everything but the apples, lemon, orange, apple juice, and liquor straight into a big pot—the biggest one you have. A heavy-bottomed cast iron pot or whatever you make stew in would be best. Peel the apples, then core them and chop them into about a ½ inch dice. Zest the orange and lemon (just the colored zest, not the white pithy parts… although both sound like they’d be great guests at a dinner party). Add the apples and zest to the pot with everything else, then squeeze the juice from the lemon and orange over the top. 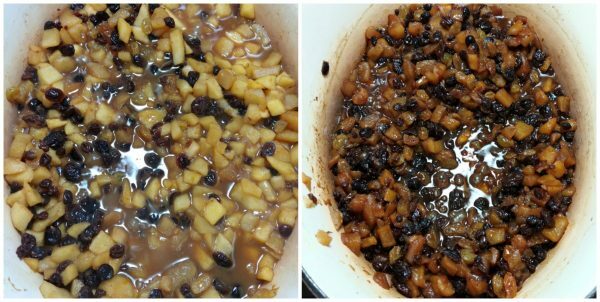 Add one cup of the apple juice, stir it all together, cover, and turn the heat to medium high. This is when I turn the heat to a low simmer, take off the lid, and check a little more frequently until I need to add some apple juice to keep it from sticking to the pan. Add about ¼ cup at a time—not too much. 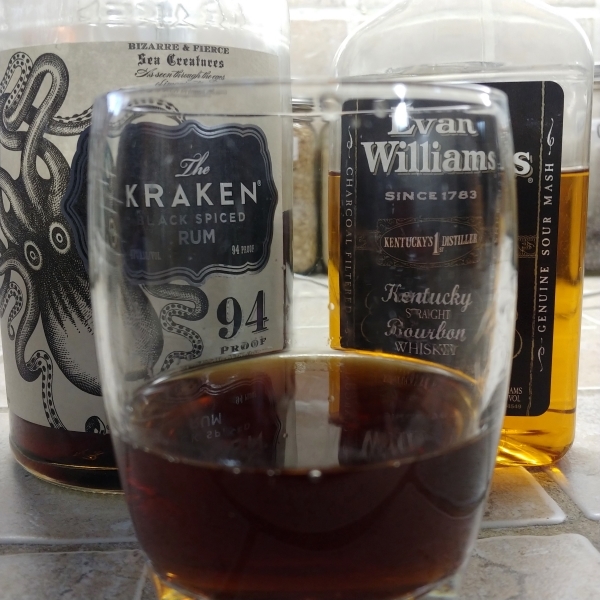 Give it a good stir, then give it about 15 minutes before checking again. Super dark brown, thick and jammy, very broken down. This is the goods. The business. The real deal. When it gets to this point, add your reserved ½ cup of juice and the liquor. Stir it all up one last time, and let it get back to the jam stage. It should take about 10 minutes. This is my jaaaaam. See how it’s super thick? So thick I can scrape it to one side and it just stays there? 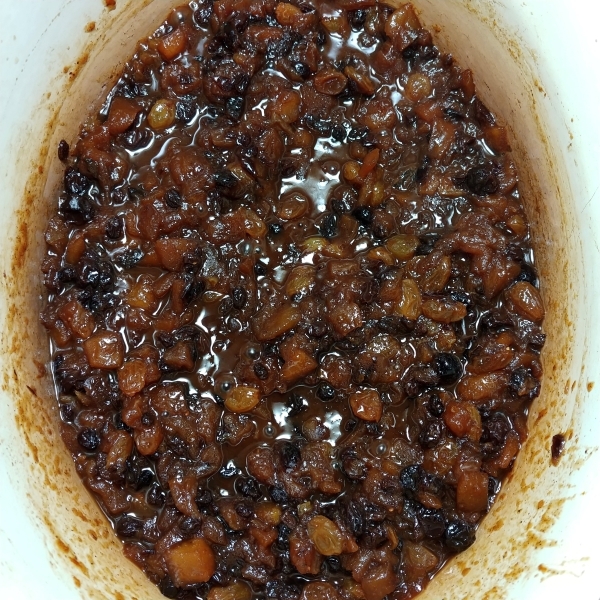 When it does this, you’re done with the mincemeat! Take it off the heat and let it cool. Refrigerate it (or freeze it) until you’re ready to make the pie. When you’re ready for the pie, heat your oven to 400F with a rack in the lower third of the oven. Roll out the bottom crust and put it in your pie pan. 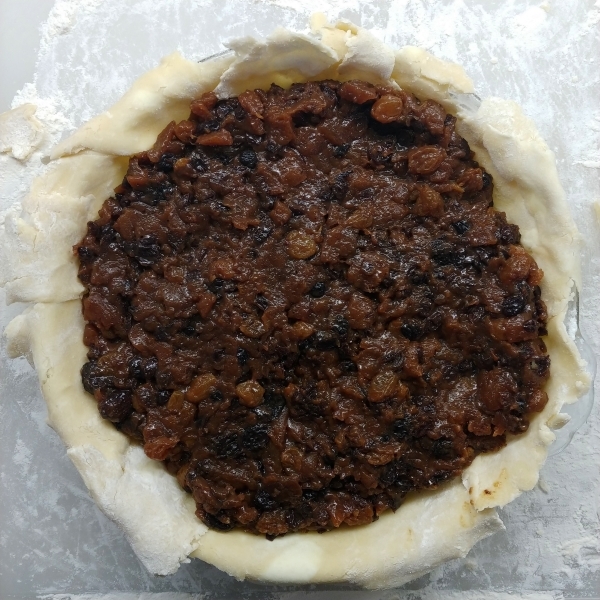 Fill the crust with your mincemeat and put the pie in the fridge while you roll out the top crust. Pop the top crust on, crimp it to seal the edges, and cut at least four slits in the top (or do something elaborate and Pinteresting if you have way more time on your hands than I do) so it can vent. Put the pie in the oven and set the timer for 25 minutes. At 25 minutes, your crust should be browning up a bit. Turn the temperature down to 350F and continue to bake for 35 more minutes, or until you can see the mincemeat bubbling up through your vents (or your perfectly stenciled paisley cutouts, HOW DO YOU HAVE TIME FOR THAT). You may want to check it slightly earlier to make sure the top isn’t browning too much. If it is, cover it with foil to keep the top from burning. I’m hoping you used the pie crust recipe I linked, and not the one I experimented with (it looked too good to be true BECAUSE IT WAS TOO GOOD TO BE TRUE and turned out awful). 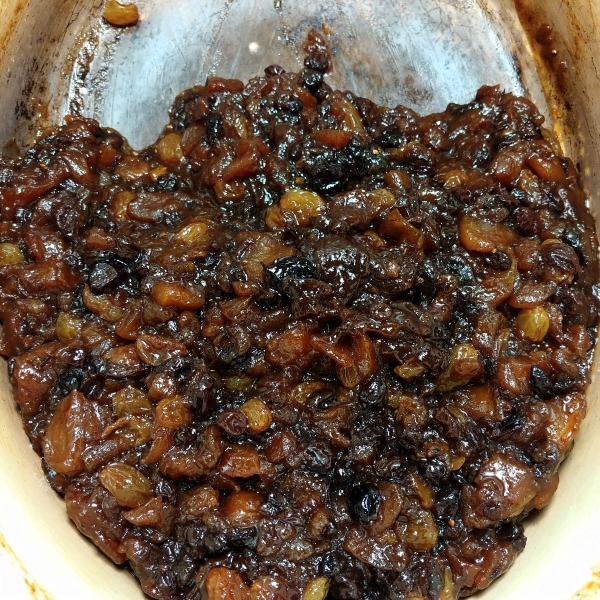 FEAR NOT, the mincemeat is so good that we barely noticed. Make sure you let it cool about 15 minutes before cutting and devouring it, preferably with ice cream. Spicey, warm, deliciously different—save a spot for this pie on your Thanksgiving table this year. We gobbed 'til we wobbled.